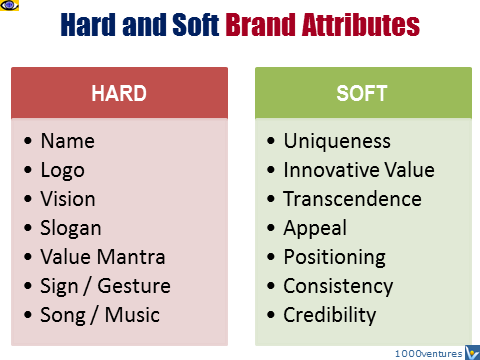 Hard brand attributes are tangible features that are developed through texts, images, sounds, and videos. Name of the company, its vision, logo, slogan, value mantra, branded signs, images, gestures, music, songs, chants, and color combinations are examples of hard brand attributes. Soft brand attributes are intangible features that are developed through development and implementation of differentiated value creation strategies. Examples of soft brand attributes are Uniqueness, Transcendence, Appeal, Positioning, , Credibility, Consistency and Sustainability.